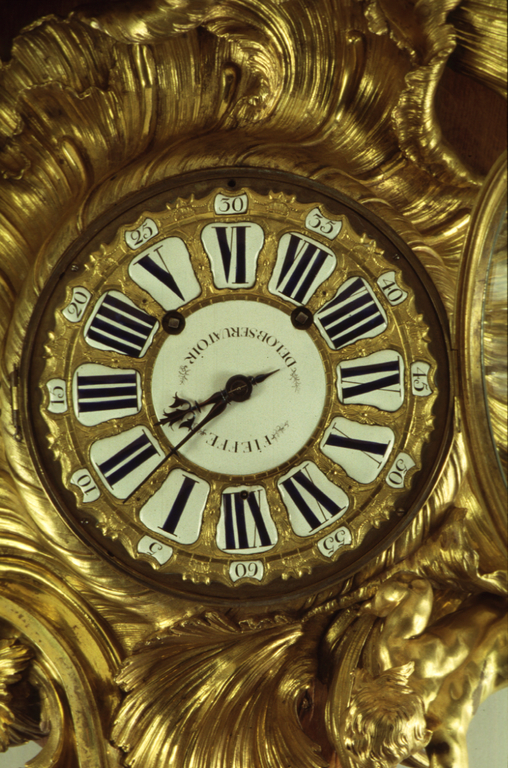 Dial painted "FIEFFE DELOBSERVATOIR"; movement engraved "Fieffé [AP]aris". 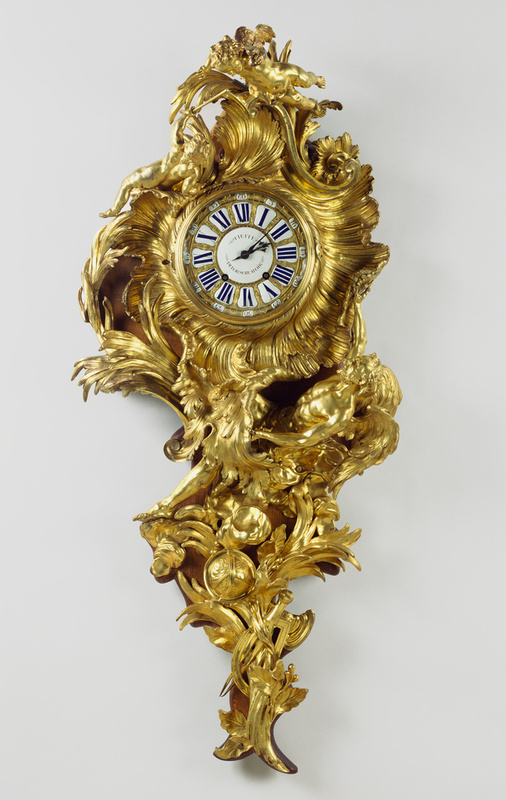 The clock's swirling leaves and asymmetrical overall design are typical of the work of Juste-Aurèle Meissonnier, a designer and goldsmith and one of the leading exponents of the Rococo style. 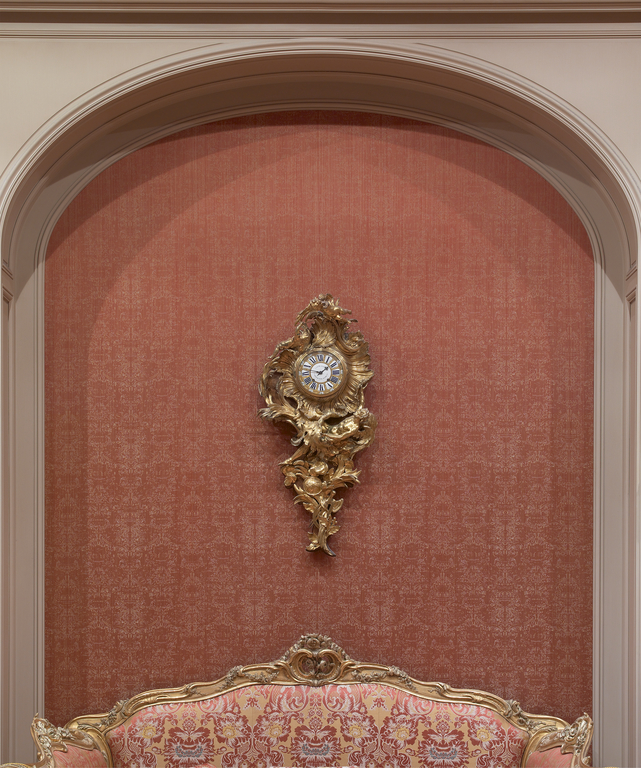 In an engraved book of Meissonnier's works, published about 1750, the antechamber wall in a cross-section of a house features a large clock with a reclining figure below the dial positioned like that on the Getty Museum's clock. 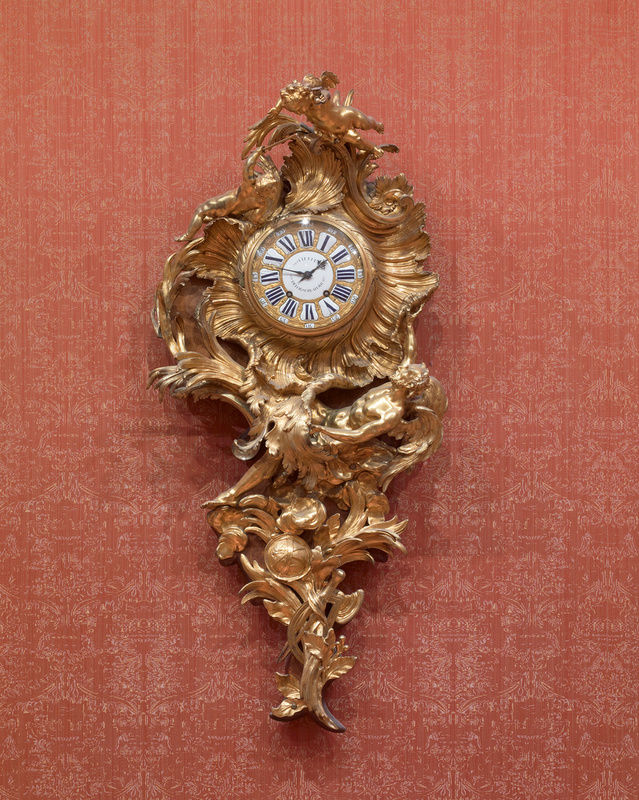 Such clocks, also known as pendules d'alcove (alcove clocks), were usually small, suitable for hanging in an alcove above a bed. 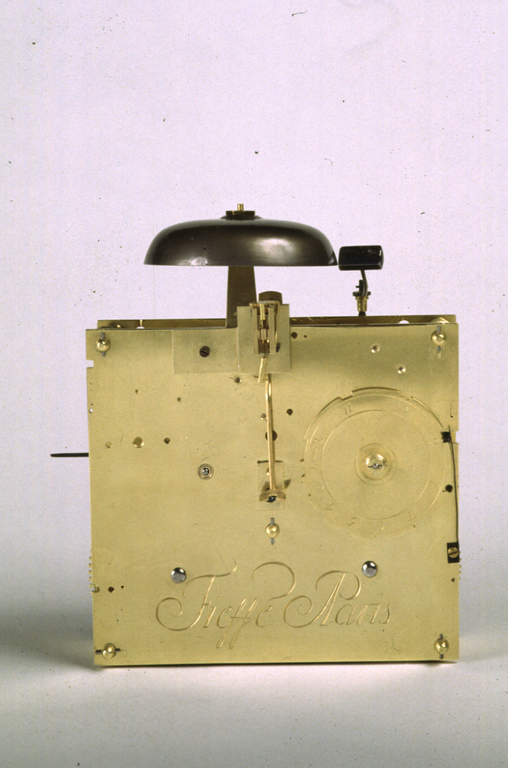 The repeating mechanisms that chimed the nearest hour and quarter hour when a string was pulled eliminated the need to light a candle to see the dial. They also prevented the constant chiming that would awaken a sleeper. This is the largest known example of the pendule d'alcove, indicating that it was made for an extremely imposing interior. 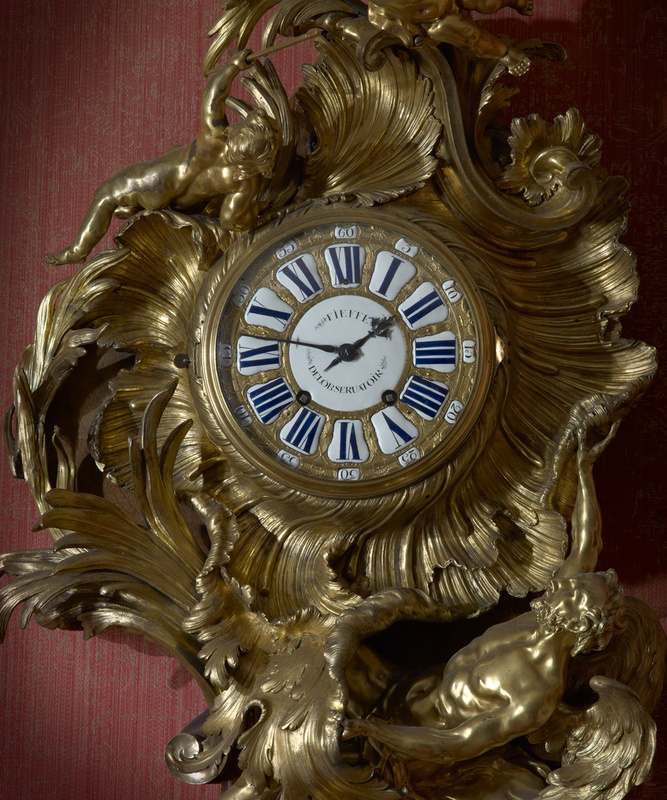 The figures on this clock represent Love conquering Time, a theme often repeated on mid-eighteenth century French clocks. The two cherubs above carry away the scythe and hourglass, the symbols of Time, while Time himself lies vanquished below with his globe, protractor, and pair of compasses. Baron (Mayer) Alphonse de Rothschild, French, 1827 - 1905 (Château de Ferrières, Tarn), by inheritance to Baron Édouard (Alphonse James) de Rothschild. Baron Édouard (Alphonse James) de Rothschild, French, 1868 - 1949 (Château de Ferrières, Tarn), by inheritance to Baron Guy (Édouard Alphone Paul) de Rothschild. Schlumberger, Eveline. "Caffiéri, le bronzier de Louis XV," Connaissance des arts (May 1965), p. 83, ill.
Wilson, Gillian. Decorative Arts in the J. Paul Getty Museum (Malibu: J. Paul Getty Museum, 1977), p. 31, no. 40. Mabille, Gérard. Le style Louis XV (Paris: Baschet et Cie, 1978), p. 175, ill.
Miller, Carole Ann Lyons. "Clockwise Special Report: The J. Paul Getty Museum." Clockwise (August 1979), pp. 15-21, fig. 6. Ottomeyer, Hans, and Peter Pröschel, eds. Vergoldete Bronzen: Die Bronzearbeiten des Spätbarock und Klassizismus. Vol 1, Katalog der Bronzearbeiten (Munich: Klinkhardt & Biermann, 1986), p. 110-111, fig. 2.3.4, ill.
Sassoon, Adrian, and Gillian Wilson. Decorative Arts: A Handbook of the Collections of the J. Paul Getty Museum (Malibu: J. Paul Getty Museum, 1986), pp. 38-39, no. 83. Borelli, Gian Giotto. Horloges et Pendules (Paris: Editions Fabbri, 1992), pp. 49, 57, ill.
Bremer-David, Charissa, et al. Decorative Arts: An Illustrated Summary Catalogue of the Collections of the J. Paul Getty Museum (Malibu: J. Paul Getty Museum, 1993), p. 86, no. 133. Wilson, Gillian, et al. European Clocks in the J. Paul Getty Museum (Los Angeles: J. Paul Getty Museum, 1996), pp. 58-64, no. 8. Augarde, Jean-Dominique. Les Ouvriers du Temps, La Pendule à Paris de Louis XIV à Napoléon Ier (Geneva: Antiquorum Editions, 1996), pp. 314-15, fig. 238. Masterpieces of the J. Paul Getty Museum: Decorative Arts (Los Angeles: J. Paul Getty Museum, 1997), p. 80, no. 60. Wilson, Gillian, and Catherine Hess. Summary Catalogue of European Decorative Arts in the J. Paul Getty Museum (Los Angeles: J. Paul Getty Museum, 2001), p. 68, no. 133. Scott, Katie. "Figure and Ornament: Note on the Late Baroque Art Industry." In Taking Shape: Finding Sculpture in the Decorative Arts, exh. cat. Martina Droth et al., eds. (Leeds: Henry Moore Institute; Los Angeles: J. Paul Getty Museum, 2009), p. 172. Droth, Martina, and Penelope Curtis, eds. Taking Shape: Finding Sculpture in the Decorative Arts, exh. cat. (Leeds: Henry Moore Foundation; Los Angeles: J. Paul Getty Museum, 2009), pp. 72-73, no. 17, entry by Jeffrey Weaver, p. 10. Bremer-David, Charissa, ed. Paris: Life & Luxury in the Eighteenth Century, exh. cat. (Los Angeles: The J. Paul Getty Museum, 2011), pp. 46-47, fig. 29, p. 119, no. 20. The J. Paul Getty Museum Handbook of the Collections. 8th ed. (Los Angeles: J. Paul Getty Museum, 2015), pp. 274-75, ill.
Christie's, New York. The Exceptional Sale. April 20, 2018, p. 118.